Weeks after thousands of sea creatures including a whale washed up dead on the shores of Nova Scotia, marine biologists are still stumped as to the cause. Officials looking into the matter said they have tested the likely factors such disease, parasites or toxins. Environmental factors, runoff pollution, oxygen depletion and the conditions on the bottom all appear normal, leaving scientists scratching their heads. Up to 20,000 animals have apparently been killed including mostly herring along with lobsters, starfish, scallops, crabs, clams and a humpback whale, which officials were looking to do a necropsy to determine the cause. 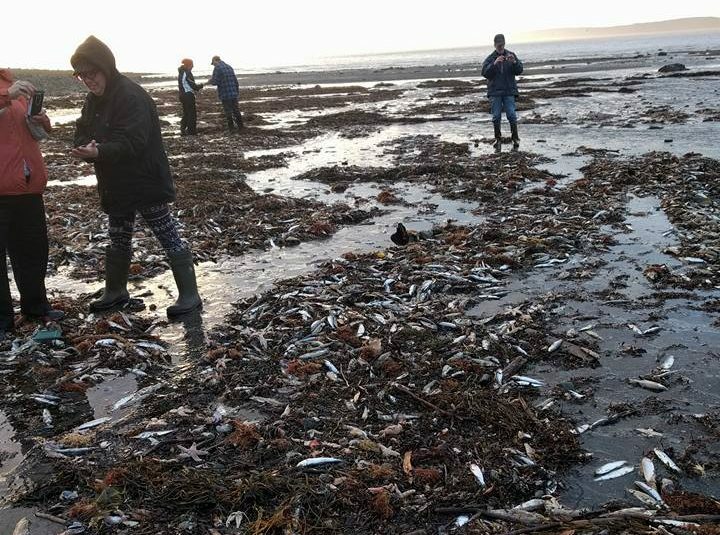 While fish die offs are not uncommon, the last one this large involving herring occurred in the Bay of Fundy in 1976 and 1979, according to press reports. There are many animal die offs throughout the world, some that are explained, but many others that are not. Some religious fanatics believe that animal die offs are a sign of the end times, citing these occurrences as a reminder of God’s judgement.